When I first started my family (Umm……..that would be 21 years ago now), I was a young mother and read everything I could about parenting. I had all of the magazines and devoured each one. I read a lot of great advice that I have used for each of my children and I also read a lot of nonsense advice that was used on my oldest and then quickly disappeared. One thing that I read over and over was the importance of the family dinner. I have held on to that advice like my life depended on it. Why? I don’t know……….maybe because it’s good advice. Family dinners are a good time to reconnect with your family. These are the people that I love the most in the world………it sure is nice to talk to them once in a while. I love to hear about their days and find out what matters to them. I love to talk about food (big surprise there) and laugh at their jokes. I just love to see their faces…….even when they are covered with food. I’ve been thinking a lot lately about the importance of FAMILY. Sure, I spend a lot of time with my kids. I watch their practices; I take them to their friends’ birthday parties; and I am actively involved with Girl Scouts and the music program at the high school. What I have come to realize is that there really isn’t any “family” time in that. What I mean is time for all of the family members to come together and interact with each other without outside distractions. Don’t get me wrong……. me being at my child’s football games and dance classes is important to them, but I still think we need that “family” time. 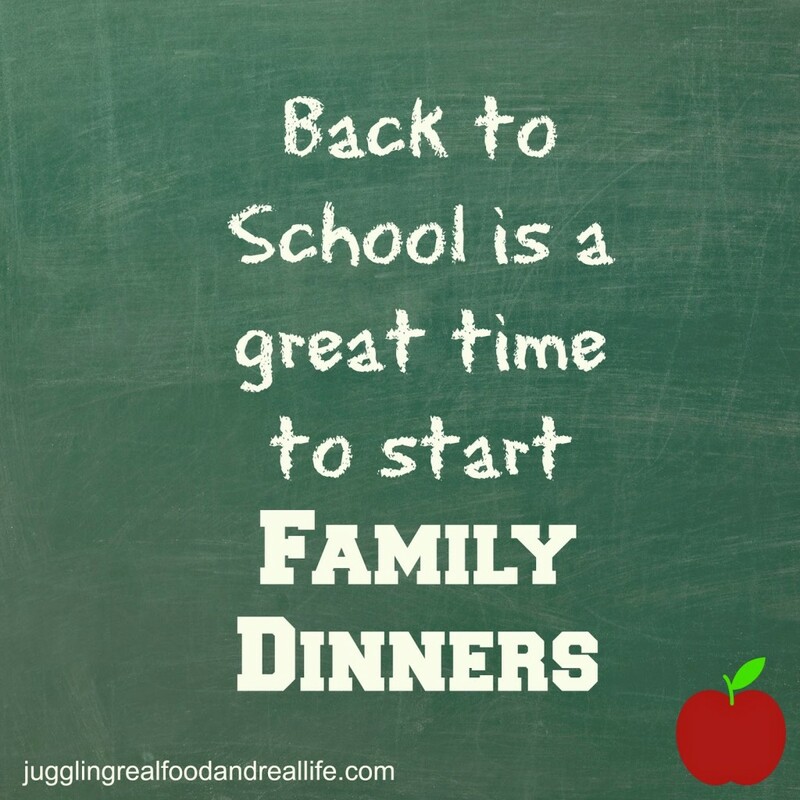 Family dinners are a great time to grab some of that family time. The meals don’t have to be gourmet and you can set whatever time works for your family……..even if it is family breakfast. We did that for a while. We eat our family dinners quite late right now, but a few snacks get us there. We tend to change our schedules depending on the sports season. I’m willing to be flexible in order to keep my family dinners. I encourage you to put family dinners on your schedule. The time you spend together with your family, just may be your favorite part of the day. I know it is for me. Do you celebrate family dinners with any special traditions? Who sets the table in your family? Who does the dishes? How often do you eat together as a family? You still haven’t signed up for the newsletter?……….Why not! It just takes a second. You can subscribe by entering your email address to the right of this page. I have lots of great recipes and fun coming this fall that you will only find in the newsletter. Please also follow Juggling on our various social media. You can easily find me there if you have questions. Twitter is a great place to chat. Follow me @jugglngrealfood and introduce yourself. The Juggling Pinterest Boards are crammed with lots of great information and recipes. Check them out! My comment seems to have disappeared before my eyes….Anyway, I agree with you completely on the importance of family dinners. Oh no…………I wonder what happened there? It's good to know that I'm not crazy for insisting on old-fashioned ways. My husband's work schedule is so crazy and unpredictable right now, and I really miss sitting down together as a family for dinner. It only happens about once a week right now. I need to be better about making dinner a family affair, even when Daddy's not home! Boy, do I know crazy and unpredictable! That is the norm in our house. Years ago, my husband was always missing dinner so we had family breakfast together. I do think it's important to keep the family unit together no matter what the combination. I'm guilty of well…………daddy isn't here so eat wherever. There are still 4 or 5 of us that can fellowship as a family. Oh well……..I'm learning!